WARNING: DO NOT EXCEED the working load limit. DO NOT USE for overhead lifting, to support human weight, for playground or athletic equipment, or as safety device. WARNING: DO NOT EXCEED the working load limit. DO NOT USE for overhead lifting, to support human weight, for playground or athletic equipment, or as safety device. WARNING: DO NOT EXCEED the working load limit. DO NOT USE for overhead lifting, to support human weight, for playground or athletic equipment, or as safety device. 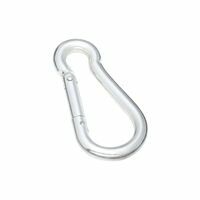 Baron Spring Snap, 75 lb, 1/2 in Snap Opening, 5/16 in Eye Width, 3-1/8 in Overall Length, Aluminum Ideal for securing keys and accessories. Versatile for students, hikers, bikers, boaters, hunters, contractors and maintenance workers. Assorted vibrant colors. WARNING: DO NOT EXCEED the working load limit. DO NOT USE for overhead lifting, to support human weight, for playground or athletic equipment, or as safety device. 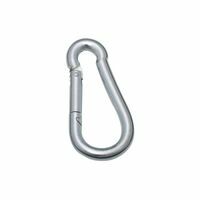 National Hardware Interlocking Spring Snap, Series: 3112BC, 165 lb Load Capacity, 5/16 in Snap Opening, 2-3/8 in Eye Width, Steel, Zinc Plated, Gray, For Lifting, Pulling, Mooring and Other Farm, Marine and Recreational Applications WARNING: DO NOT EXCEED the working load limit. DO NOT USE for overhead lifting, to support human weight, for playground or athletic equipment, or as safety device. 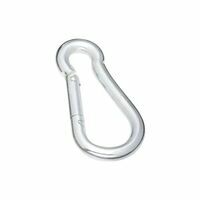 Designed for use with rope, chain, strap, animal leashes and other home, farm an recreational applications.